Remember making mixtapes on actual cassettes? (Maybe we’re dating ourselves.) Now you can with a modern twist. 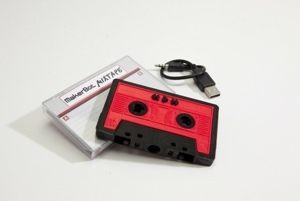 MakerBot’s Mixtape looks like a cassette, but you only need to plug it into your computer, drag and drop your files and send it off. It’s also a player, so all you need to do is plug in some headphones.